Can we “Believe” again after Chesterfield? I would have loved to have gone to Chesterfield and been part of the Wigan contingent that was so deliriously happy after that stunning finale. But it would have been a long trip from Boston to get there and I would have been shirking my family responsibilities. However, I thought I could at least settle for second best, by listening to the Neill Rimmer and Ashley Houghton commentary on WISH FM. But when it was decided by family consensus that we were leaving for an overnight stay in Rhode Island around kick-off time in the UK it seemed that my hopes were dashed. However, son Ned and 3G technology came to the rescue. As we were being driven along the I-95 interstate highway we were able to listen to Latics Player through Ned’s phone. The score was 0-0 at halftime, when he closed his phone down to conserve the battery’s charge. It sounded like the game could go either way, both sides having had their chances. But the second half started and Chesterfield were to score a spectacular goal a quarter of an hour later. However, hope remained that Latics could pull one back. It was a little hard to hear the phone so when we heard that Leon Barnett had scored a goal, Ned and I started to celebrate. But then came the realization that then goal was for Chesterfield, not Wigan. In an instant I suggested to Ned that he turn the commentary off to save the battery. When we arrived at our destination I realized what I had done. 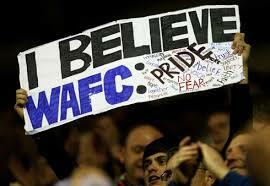 I have watched Wigan Athletic since 1961 through thick and thin. I have prided myself on never having left a match before the end, no matter how dire the performance. I have always tried to see the bright side. I believed in “Believe”. But in this case I was “he of little faith”, giving upon a game before it had finished. Fortunately Ned had more faith than me and by the time he got the commentary back the game was in its last three minutes and Latics had scored twice. When Hiwula scored in the 90th minute we were ecstatic. Watching Latics over the past twelve months has tested the mettle of even the most fervant supporters. Being two goals behind with less than a third of the match remaining there would have been no way that last year’s team could have clawed their way back in. In the first half of last season the team had the talent, but not the commitment. The reverse was the case in the second half. Malky Mackay was no tactical genius, but the asset-stripping that happened in the January transfer window had left him with a squad short on quality, with the few remaining players from previous eras seemingly shell-shocked by the sequence of events. Put simply, it was very hard for us to “Believe” in the Mackay era. But under Caldwell I can at least rekindle some belief. Caldwell is viewed as a disciple of Roberto Martinez, who was a man brimming in belief. His infectious belief was always evident – he truly believed that his multicultural squad of bargain signings could beat the best in the country without resorting to dubious methods. Moreover he succeeded and his team’s league wins over Arsenal, Chelsea, Liverpool and Manchester United and the FA Cup final victory over Manchester City will be etched in our minds for years to come. The journey was by no means easy. At times Latics looked out of their depth, characterized by a porous defence and a tactical system where the term “lone centre forward” became a reality. Martinez could be frustrating for all of us, playing seemingly one-paced football, never seeming to have a plan B. But he believed in his players and they so often played out of their skin against some of the best players in the world. He defied the odds and kept Latics up in the Premier League for three seasons before the seemingly inevitable happened in the loss against Arsenal. With Martinez one always sensed that he had a long term plan and that he believed it would come into effect. Caldwell rightly claims he has been influenced by all the managers he worked under. But many would say that it was Martinez who influenced him most. One wonders if he is still in regular contact with the Catalan, who has provided him with two quality loan players in Jonjoe Kenny and Francisco Junior. Moreover the way he is pushing his wing backs so far up the field is reminiscent of what Martinez did with Coleman and Baines in his early days at Everton. But does Caldwell have that sheer determination that his mentor had? As a player Caldwell was certainly determined. Joining Latics relatively late in his career, and despite with his hips failing, he was always there to be called upon. Latics had their greatest successes under his captaincy. He was the marshall of a back line, which was playing against the odds as it faced household name strikers on a regular basis. Caldwell certainly made mistakes as a player, but his commitment could never be questioned. The “New Era”, heralded by Caldwell and young chairman, David Sharpe is now the order of the day. Largely through poor choices made by Sharpe’s grandfather, Dave Whelan, Latics have fallen down two divisions since winning football’s oldest competition. However, nobody who has watched the club’s rise over the past two decades can doubt the wonderful achievements under Whelan. The “Believe” motto did not exist when DW told people that a struggling club in the fourth tier would be in the Premier League within a decade. It was not only Whelan’s financial backing, but his “belief” and sound management of the club that propelled things along. Now it is the era of a rookie manager and a rookie chairman, both of whom have nevertheless started their jobs in impressive fashion. Caldwell clearly believes in the kind of football that he practiced under the auspices of Martinez. However, Caldwell has already shown his flexibility and willingness to change a tactical system if it appears not to be working. His teams have already played in a variety of “shapes” , something Martinez was loath to do. Put in a nutshell, Caldwell adheres to the Martinez notion of style, but is more pragmatic about adapting his tactical formations to get results. However, being a broad adherent of the Maritinez brand he will broadly insist on a slow build up from the back, coupled with a possession-style football. In the days of Martinez his players were faced with the enormous physical task of containing the talents of teams they played in the Premier League. Maintaining possession gave his players the breathing space to hold their own physically against opposition that was so often technically superior. Clearly a level of frustration from a fan not happy with Caldwell’s approach of patiently playing the ball out from the back. However, this fan was apparently not at the game. If he had been maybe he would have thought of joining the others who left the Proact Stadium prematurely and missed out on the last ten minutes. Up to that point it looked like Latics were heading for another 2-0 away defeat, something hard to bear for a fan base that has stayed loyal despite the awful football that they have had to endure over the past year. Interestingly Caldwell has made every effort to play attacking football, pushing his wing backs high up the pitch. Moreover at Chesterfield he had both Michael Jacobs and Haris Vuckic supporting centre forward Craig Davies from attacking midfield positions. The wing backs tend not to tuck inside to support the central midfield, their main role being as outlets on the flanks The end result can be the two central “holding” midfielders being outnumbered by the opposition, unless the attacking midfielder drops back. Fan frustration was certainly present during the Martinez era, especially at the beginning when the players would often struggle to translate the manager’s ideas into effect. It has been a similar case for Caldwell so far. His is a work in progress, with bad moments interspersed with glimpses of the sublime. A group of strangers on the field is gradually melding into a cohesive force. But not only is it a matter of new players “bedding in”. The club is still on its way out of a trough of depression, where not winning was the order of the day. That amazing rally at Chesterfield will surely lift the club and its players. Confidence is the key to success for Caldwell’s team. Despite the frustrations of some fans Caldwell will persevere with a style of play he believes in. He has already shown himself to be more tactically flexible than Martinez was at Wigan, but will insist on his footballing principles. Self-belief is a key quality in a football manager. If Caldwell can continue to inculcate his footballing philosophy into his players they will surely respond. The current season has had its ups and downs – and there are surely more of the latter still to come – but there is purpose in the way his team is playing. Caldwell is fortunate in having very few players from prior regimes at the club still present. It is much easier to set the tone of a new philosophy with a new group of players rather than with those who were entrenched through longevity and working under previous managers. There are lots of fans who consider that it is time to leave behind the “Believe” motto of yesteryear. The days of “I’m a Believer” beaming out from the loudspeakers at the DW Stadium might soon be over. “Believe” sadly became overused for political purposes within the town. Whether “Believe” as a motto will become a thing of the past is hard to predict. But what is crucial is that Caldwell continues to hold by his footballing principles and shows the kind of belief in his players that Martinez showed. Over the past couple of seasons too many potentially good players have been dumped before their time was due. The time has come for a group of committed, talented players to be given a genuine chance at the club. Caldwell and his recruitment team have done an amazing job in bringing twenty new players to Wigan. He now needs to give them the support they need to produce their best. There has been far too much upheaval. Now is the time for consolidation. Put simply, the manager needs to “Believe” in the players he has brought in. ← Is Caldwell’s squad too young?